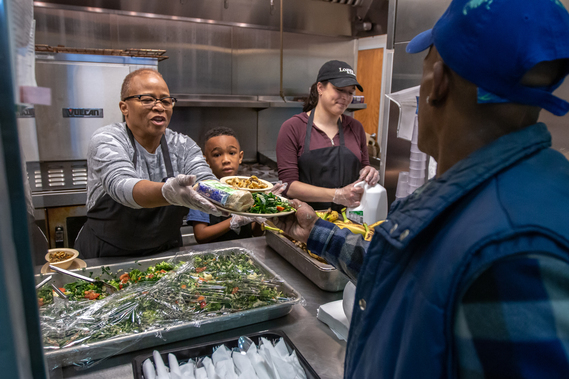 Loaves and Fishes - a Minneapolis-based non-profit that serves free meals across seven Minnesota counties - recently served its millionth meal statewide in 2018, and Minneapolis-St. Paul International Airport (MSP) played a significant role in providing many of those meals. Pictured above: Food from MSP at a Loaves and Fishes dining site located at a Salvation Army in North Minneapolis. The partnership between Loaves and Fishes and the airport began a little more than a year ago, as Loaves and Fishes picks up ready-to-eat items from airport concessionaires that are about to expire and then distributes them to those in need. In recent weeks, individual pick-ups at MSP have totaled between 450 and 600 pounds per load. The food donations can end up at any of Loaves and Fishes’ 54 locations across the seven counties. The ready-to-eat items have been popular at several of Loaves and Fishes’ street-outreach sites in the Twin Cities area. Pictured: Volunteers with Loaves and Fishes serving meals at a Salvation Army site in North Minneapolis. A couple of times each week, a truck pulls into a loading dock at MSP Airport and receives donations from concessionaires HMSHost and Caribou coffee shops. Another concessionaire, Delaware North, also provides donations. HMSHost, which operates numerous restaurants at MSP, including French Meadow, MSP-To-Go and Starbucks, conceived the idea of donations to Loaves and Fishes. 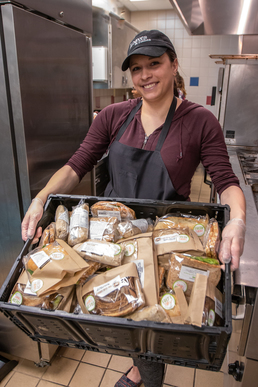 Food safety and quality standards in HMSHost restaurants mean that its leftover pre-packed foods – such as sandwiches and salads – have been ideal for the program. “The donation program has worked well in its first year,” said Butch Howard, HMSHost senior director of operations at the airport. HMSHost’s donations are part of its company-wide commitment to community service and sustainability. “We’re very happy to help out Loaves and Fishes and to put the leftover food to good use,” Howard said.